Armour's Answers – What Is the Age of the Earth? Many people believe the Bible indicates that God created the earth no more than several thousand years ago during a period of six 24-hour days. However, modern science argues that the earth evolved over a period of billions of years. Which of these two beliefs is true? First we will discuss viewpoints regarding the age of the earth and then we will consider how much time was required for the earth to be formed. Those who argue that the earth is only several thousand years old, generally base their argument on information in the Old Testament regarding ages and genealogies, and the belief that the first man (Adam) was created by God on the sixth day of His creation of the universe. [T]here are . . . good reasons to believe there are some gaps in the Genesis genealogies. It is better to view Genesis 5 and 10 as adequate genealogies, not as complete chronologies. [S]ince there are known gaps in the genealogies, we cannot accurately determine the age of the human race by simply adding the numbers in Genesis 5 and 10. Ever since the publication in 1890 of William Henry Green’s classic article “Primeval Chronology,” which demonstrated that the genealogies of Genesis were not strict father-son relationships, it has been commonly acknowledged that the precise antiquity of the human race cannot be determined from the Genesis genealogies. Careful study of the actual usages of the Hebrew and Greek terms for “father” and “beget” reveals that they often signified nothing more definite than direct line of ancestry. Perfectly clear in the Gospel record is the fact that Jesus was addressed by suppliants as “Son of David,” though He was born over 960 years after David died. One of these sciences is geology. The study of the earth’s crust has yielded much evidence that the earth is very old indeed. There are gorges, for example, that have been cut back by streams for great distances. One has only to measure the amount of such erosion during a given historic period in order to form some idea of how long the process has gone on. The depth of the slowly accumulating sediment in the bottom of the oceans is another indication. Interesting evidences of successive ice ages offer still another clue. The other science is astronomy. Scientists have developed ways of determining the distances of the various stars from the earth, distances so vast that they are measured in light-years. (A light-year is the distance that light travels in a year’s time – nearly six trillion miles!) 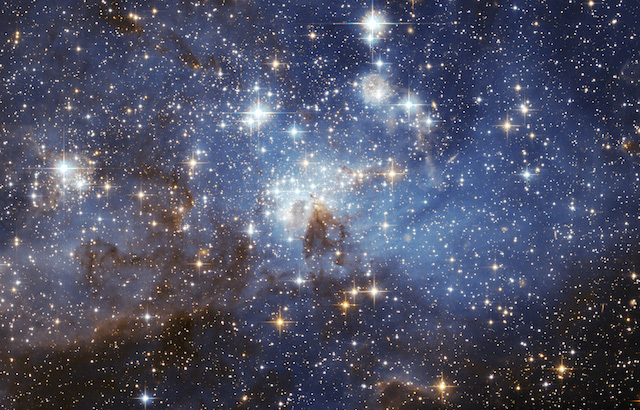 Many stars are known to be millions of light-years away. Therefore the light that is reaching our eyes now from these blazing suns must of necessity have started on its journey millions of years ago. The starry heavens, then, must be very old indeed. The credibility of several types of geological evidence is questioned in Scientific Creationism, a book edited by Henry M. Morris, Ph.D. On page 94 of the book, the assertion is made that . . .
[T]here is no type of geologic feature which cannot be explained in terms of rapid formation. . . . The “immensity of time” demanded . . . by evolutionism is by no means demanded by the actual facts of the geologic strata. Then, on page 136 of the book, it is argued that . . .
Fossils are used as the only key for placing rocks in chronological order. The criterion for assigning fossils to specific places in that chronology is the assumed evolutionary progression of life; the assumed evolutionary progression is based on the fossil record so constructed. The main evidence for evolution is the assumption of evolution. Therefore, the fossils really do not provide a satisfactory means for dating rocks. . . . Consequently there is certainly no real proof that the vast evolutionary time scale is valid at all. As far as the age of geological formations and of the earth itself are concerned, only radioactive decay processes are considered useful today by evolutionists. . . . In each of these systems, the parent (e.g., uranium) is gradually changed into the daughter (e.g., lead) component of the system, and the relative proportions of the two are considered to be an index of the time since initial formation of the system. The system must have been a closed system. That is, it cannot have been altered by factors extraneous to the dating process; nothing inside the system could have been removed, and nothing outside the system added to it. The system must initially have contained none of its daughter component. If any of the daughter component were present initially, the initial amount must be corrected in order to get a meaningful calculation. The process rate must always have been the same. Similarly, if the process rate has ever changed since the system was established, then this change must be known and corrected . . . if the age calculation is to be of any significance. Other assumptions may be involved for particular methods, but the three listed above are always involved and are critically important. In view of this fact, the highly speculative nature of all methods of geochronometry becomes apparent when one realizes that not one of the above assumptions is valid! None are provable, or testable, or even reasonable. It is impossible to ever know the initial components of a system formed in prehistoric times. Obviously no one was present when such a system was first formed. No process rate is unchangeable. Every process in nature operates at a rate which is influenced by a number of different factors. If any of these factors change, the process rate changes. Rates are at best only statistical averages, not deterministic constants. [I]t is Biblically reasonable to think of the universe as not now expanding, but perhaps having shrunk from its initial size or else remaining static in size since Day Two. . . . [T]his could mean that the initial velocity of light at the end of Day Two was higher than it is now by many orders of magnitude. Modern cosmology assumes uniform conditions and immutable laws of physics from the present moment extending backwards in time to the beginning of time . . . . Unless cosmological theorists are willing to make allowances for what has been given to us concerning the early history of the universe by revelation from our Creator, secular theories of origins are bound to contain fatal flaws. There are over 500 methods of dating used by scientists, historians, archeologists, and chemists. When more than one of these methods are used, they usually give similar results, and none of them give an age to man or to life as small as 10,000 years. Thus, there seem to be plausible arguments on both sides of the debate as to how long ago animal life and humans came into existence, as well as the age of the Earth. However, when all the evidence is considered, there seems to be more than ample proof that the Earth and the rest of the universe are much older than can be inferred from trying to link together the ages of people mentioned in the Bible. How Much Time Was Required for the Earth to Be Formed? Our days of twenty-four hours would seem to have no meaning apart from the rotation of the earth on its axis as the sun shines on it; but the sun is not introduced as the governor of days and seasons until the fourth “day.” . . . The concept of long ages in the creative process seems to accord better with known scientific facts. The days of Genesis 1 could have a time lapse before the days began (before Gen. 1:31), or a time gap between the days. The same Hebrew word “day” (yom) is used in Genesis 1-2 as a period of time longer than 24 hours. For example, Genesis 2:4 uses it of the whole six day period of creation. Sometimes the Bible uses the word “day” for long periods of time: “One day is as a thousand years” (2 Peter 3:8; cf. Ps. 90:4). On the third “day” trees grew from seeds to maturity and they bore like seeds (1:11-12). This process normally takes months or years. On the sixth “day” Adam was created, went to sleep, named all the (thousands of) animals, looked for a helpmeet, went to sleep, and Eve was created from his rib. This looks like more than 24 hours worth of activity. The early Genesis narratives model historical realities after the fashion of an analogue model: there is a genuine structural correspondence between the features of the model and the historical realities which mediate the spiritual content, but this correspondence is not understood in terms of literal pictorial representation. Evidently God did not create the universe in a single step, by one all-encompassing command, as Big Bang cosmology would infer. He created the universe (visible and invisible) in a time period of six days. During this interval the usual laws of physics were not in effect. We should . . . remind ourselves not to attempt to understand creation week by extrapolating present days [sic] laws and observations backwards from the present. God is the observer in Genesis Chapter One, so we must take his [sic] word for the order of events during creation week. For instance, He tells us that the length of each of the six created modules, or days (yom), is what we now know as a standard 24 hour day. That is, our present cycle of 7, 24-hour days per week is stamped from the template of the seven days of creation. The clock appointed by God to keeping time for us was not set in operation until Day Four, however (Gen. 1:17, 18). Dynamical time is determined by the motion of the sun, moon and stars. . . .
[T]here is no rational reason, no cosmic reason, no philosophical reason, no mathematical reason, and no scientific reason for seven-day weeks. There is frankly no other explanation for why the 365 days of our solar years were divided into sevens. The year doesn’t even divide neatly that way. So why are our calendars ordered by weeks? There is only one reason: God Himself established that order in the pattern of His creation. We believe that although there are arguments that raise questions as to the credibility of certain scientific evidence that supports the position that the universe is billions of years old, there is a tremendous amount of scientific evidence to support such a position. Also, scientific evidence indicates that the creation of the universe took considerably longer than six 24-hour days, and the biblical account of creation does not necessarily contradict this belief. [S]omething should be said about some startling new geological discoveries that render the long-date [i.e., old earth] estimates of conventional geological science nearly impossible to hold any longer. An extensive analysis of the evidence supplied by an exposed stratum on the bed of the Paluxy River, at Glen Rose, Texas, has been published . . . under the title Valley of the Giants. . . . In the Bible-Science Newsletter for April 1979 (p. 4), there is a report . . . concerning a 1978 field trip to this remarkable site. It exhibits on the very same stratum a good set of three-toed dinosaur tracks and then further upstream the characteristic tracks of Tyrannosaurus Rex and also of Brontosaurus. The low level of water during the summer drought made it especially easy to uncover and view areas where clear footprints of some early human species actually cross the tracks of those dinosaurs. Furthermore, in an adjacent level on the same Cretaceous layer as these tracks, there was a long black streak that proved to be a fallen tree branch that had been reduced to charcoal by fire and was subsequently engulfed in the limey surface. . . . A section of this branch was removed and sent to . . . a geophysicist at UCLA for carbon-14 analysis. He later sent back his finding: the branch was 12,800 years old, +/- 200 years. An editorial on p. 2 of this same issue of Bible-Science Newsletter furnishes an important clue as to the source of . . . gross error in the conventional geochronological methods of time computation. The careful analysis of fissionable minerals (such as the breakdown of uranium to lead or of argon 40 to argon 36) has operated on the simplistic assumption that all such deposits were originally composed of pure parent elements. Then after the magma cooled off, the parent element supposedly began to break down with the gradual loss of electrons and became the daughter element with a lower atomic count. But samples taken from the core of fairly recent volcanoes, one thousand years old or less, have specimens evidencing ages of many millions or even billions of years – judging by the proportion of daughter elements to the parent elements in the same sample. This inevitably yields the result that even in the initial stage of deposition, such fissionable formations already contained a high proportion of daughter elements. Therefore, they are almost valueless, or completely misleading, for the dating of the levels in which they are found.